Tattoos. 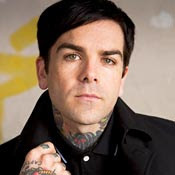 Everyone from blink-182's Travis Barker to Bring Me The Horizon's Oli Sykes are covered with ink. And let's face it, it's freakin' cool. But have you ever stopped to wonder who put that ink into their skin? I mean, have you ever thought about what it's like to be on the other end of the needle? If you've answered yes to this question, like I did, then you might want to check out the book "Tattoo Machine" by famed artist Jeff Johnson. It's a memoir like account of nearly two decades of life lived in the world of ink. From dumpy tattoo shops across the US to the most horrendous medical oddities you can imagine, this book is an interesting look into the real tattoo world. This read is not what you would get on say TLC's LA Ink or A&E's Inked. Forget the glamour and forget the fame. "Tattoo Machine" gives us an idea of what it's actually like to be hunched over some overweight dude you don't know for six hours at a time. Johnson's writing is filled with bizarre stories ranging from outrageous pranks pulled at his Portland, Oregon shop, The Sea Tramp, to what it's like to unknowingly tattoo a serial killer. Believe me, that chapter will have your skin crawling. He recounts growing up in the industry; seeing it boom and seeing its artistic decline. Often using too much metaphorical prose, and sometimes straying from the point, "Tattoo Machine" can leave your brain feeling freshly inked. Yikes. But overall it's a must read for anyone interested in body art. And I mean, who in rock 'n' roll doesn't like tattoos? Spend a day at Warped Tour and you'll see my point. Everybody has got at least one, and some of the dudes in bands are artists themselves. No, seriously, I'm telling the truth. Frank Carter, The Gallow's brutal lead singer, was tattooing long before his band came together. And if you've caught any of this season's LA Ink you might have seen some guest work done by none other than The Dear & Departed's Dan Under. Music and tattoos have gone hand in hand for years now, and show no signs of stopping any time soon. So honestly, pick the book up and get reading. That way the next time you're at a show and the 16-year-old girls next to you are talking about what they're going to get when they turn 18, you can let 'em know a thing or two about what tattoos are all about.